In the bustling town of Havelock, North Carolina, the Marine Corps Air Station (MCAS) Cherry Point provides excitement for all and employment for many. Home of the 2d Marine Air Wing with five deployable Marine Air Groups, Cherry Point also houses the Fleet Readiness Center (East). This large industrial hub provides depot-level maintenance, repair, and rebuild services for Naval Aviation assets worldwide. The base serves as the East Coast point of embarkation for the Corps and has moved more than 35 tons of military equipment overseas in the last three years. Some two miles east of the Main Gate of the MCAS, on the other side of NC Highway 101, is another hotbed of industrial activity. Here, flying the national flag and an equally large OSHA Safety award flag is TANDEMLOC, Inc. This company designs, manufactures, proof-tests, and ships hardware to “lift, secure, fasten, and mobilize” loads to over 1 million pounds. In 1973, founder John M. DiMartino, Sr. created a manufacturing company on Long Island, New York, that produced marine transportation securing and mobilizing hardware. The lifting, loading, and securing of ocean-going cargo containers required very special equipment to ensure safety underway. DiMartino designed and patented many container securing and fastening devices. His original company produced a fairly wide range of maritime-associated items for a variety of consumers, particularly the intermodal transportation industry—but, in the late 1970s and early ’80s, it became increasingly difficult to compete against foreign entries into that wider product market. Difficult times forced the company to close and regroup: to change its target market, to focus on the smaller, unique items, and to form a new industrial entity. In 1984, the new company, TANDEMLOC, Inc., was literally born in the basement of DiMartino’s home on Long Island with his eldest son, John M. Jr. They concentrated on providing the unique items that no one else could provide. Success was immediate and growth was slow but steady. They continued to market niche products associated with cargo containers, but also began to develop lift spreaders and lift slings. While TANDEMLOC did the engineering in-house, the machining and welding were contracted out, and assembly and testing were performed in very modest facilities. During this period, the company turned its focus to the design and construction of a testing machine for its lifting hardware. The transition from Long Island to North Carolina became necessary for a number of good business reasons. Growth proved difficult on Long Island because of real estate prices, tax increases, labor costs, power costs, and environmental regulations. After a 1990 trip to Florida by John, Jr., his wife, Sue, and their children, the couple began to consider the prospect of moving to the Carolinas. Several months of research and trips throughout the southern states brought the family-operated business to the city of Havelock, North Carolina. At the beginning of 1992, the city, eager for commercial growth, offered TANDEMLOC a 5,000-square-foot building for the attractive fee of $1 per month. It was a good deal for both parties. The company transferred to Havelock in November 1992. Much of the business in those years consisted of work for the Department of Defense or the department’s prime contractors. As its employee base expanded, so, too, did its production capabilities. A larger percentage of manufacturing moved in-house, improving both processing and quality. Product diversity allowed for a shift away from the defense industry and increasingly toward the heavy construction industry. The company gradually transitioned away from sole production of cargo container products with the addition of lifters of various sizes and tie-downs of assorted types. Demands for “similar but not same” products drove engineering development and earned TANDEMLOC its reputation as a custom house. In 2000, TANDEMLOC launched a Website and expanded its main facility by 10,000 square feet, resulting in increased customer demand and production. The next significant development came in 2004, with the unveiling of a much more comprehensive website. Business increased significantly and TANDEMLOC needed and built a bigger testing machine. This in-house testing capability supported the research and development of new products and the production and testing of beams and frames up to 60 feet long with working load limits (WLL) of 300 tons. By 2005, increasing demands for product led to the construction and equipping of an additional 25,000 square feet of manufacturing space at TANDEMLOC’s headquarters. The additional space included construction of a much larger testing facility, now completely indoors. This testing facility also houses a data recording studio. TANDEMLOC digitally and visually records each and every test, and proof-tests every single lifter that’s manufactured. The increased space also allowed for an expansion of the CNC machining department. Progress didn’t stop there—2008 saw the construction of a 20,000-square-foot warehousing and materials processing center, located a stone’s throw from its Havelock headquarters. Since the move to North Carolina in 1992, Tandemloc's facility grew from 5,000 sq ft to over 66,000 sq ft on 12 acres of land. The facility has an impressive CNC machining center and plenty of conventional robotic welding machines. Below the American flag is the 'Sharp Award Flag' awarded by OSHA in recognition of Tandemloc's excellence in health and safety. In 2011, TANDEMLOC further broadened its product line by designing and manufacturing several new products for the below-the-hook market. To date, these new products include a range of Pallet Lifters in lightweight, wheeled, and counter-balanced models; automatic Pipe Grabs (tested to 200% of their capacity); and Coil Hooks. Unlike competing products, these items are in stock and individually proof-tested. In another industry first, the company has announced its Rapid Ready line of products. The aptly named line constitutes custom products that are quoted instantly, and are then designed, manufactured, proof-tested, and shipped in five to seven days. Among its first offerings are Custom Lift Beams, which are available in spread length from one to 20 feet. On the drawing board and soon to be available are Rapid Ready Spreader Bars. In 2012, TANDEMLOC purchased an adjacent 6,000-square-foot building on three acres of land for future manufacturing expansion. Having started with only three employees, the company today employs a workforce of 53. Since the establishment of TANDEMLOC in 1984, the company has been family-owned and led by the DiMartinos. Founder John Michael “Mike” DiMartino ran the company and has been followed in that role by his oldest son, John M. DiMartino, Jr., the current President of the company. His younger son, William, serves as Vice President and Director of Engineering for TANDEMLOC. Adding to the company’s “family feeling,” there are three DiMartino daughters, two DiMartino sons-in-law, and two sons-in-law of the Production Manager, all occupying key positions. The worldwide, world-class client list includes the U.S. Department of Defense, the Atomic Energy Commission, major defense contractors, power plants, heavy construction, intermodal / maritime transporters, and other parts of the lifting and securing commercial world. Some special projects have included the custom construction of a special cradle to house the 9/11 Memorial fragment displayed by the City of Havelock. The founder’s three strong operating philosophies are clearly in evidence in the everyday functions of this company. GUARANTEED CUSTOMER SATISFACTION: A key component of customer satisfaction is on-time delivery of a high-quality product at the best possible price. TANDEMLOC has successfully achieved this goal through increasing “Made in America” content wherever possible. As across-the-board demands have increased for many of the most popular items, Production Manager Curt Pope has been encouraged to find ways to manufacture in-house because off-shore vendor delivery times were not acceptable on some component parts. By investing in available new methodologies and continuous process improvement, Pope and his team are providing better quality, lower costs, and reduced lead time on two of the highest-demand items. In the case of the Rotating Lift Lug—the component part of all bottom lift slings that fits in to the lower four corners of cargo containers—the cost per piece was reduced by 15% and availability for rapid deliveries was assured. The team implemented similar processes to secure quality and delivery of a popular container connector and its Center Threaded Spindle. A new CNC lathe allowed production of that spindle in-house, again ensuring on-time deliveries. Tandemloc's patented Proof-Test machine facilities gearing up for another test - every single lifter produced is proof tested! QUALITY: TANDEMLOC provides quality assurance to its customers by insisting that every single below-the-hook lifter produced is proof-tested. The proof-testing process begins with the purchase order, then follows through engineering design, engineering test plan, and production work order to actual testing prior to delivery. 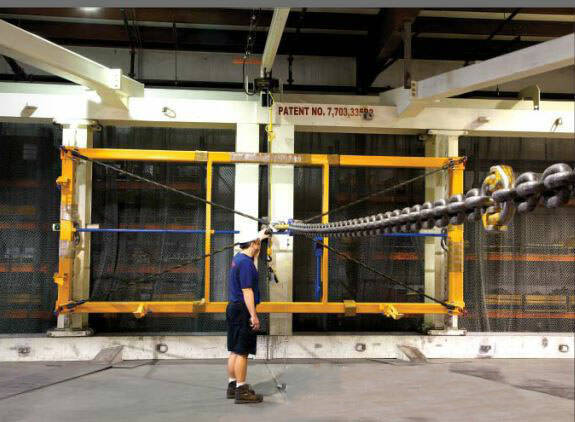 TANDEMLOC has designed, patented, and built a test stand that tests each and every deliverable below-the-hook device. These tests are recorded on DVDs, and certificates are provided to the customer with each deliverable. The slogan “Proof Tested Since 1984” appears wherever the TANDEMLOC, Inc., logo is displayed.